This week we had an opportunity to share our perspective on the impact of rising drug prices and the work we do as a pharmacy benefit manager (PBM) to help control costs for payors and their plan members. Our goal as a PBM is simple: to reduce costs and improve health outcomes. We do this by negotiating discounts with manufacturers, designing formularies that encourage the use of generics and biosimilars, providing information in real-time to doctors, pharmacists, and consumers and also creating new tools to help bring escalating drug prices under control. Our goal as a PBM is simple: to reduce costs and improve health outcomes. 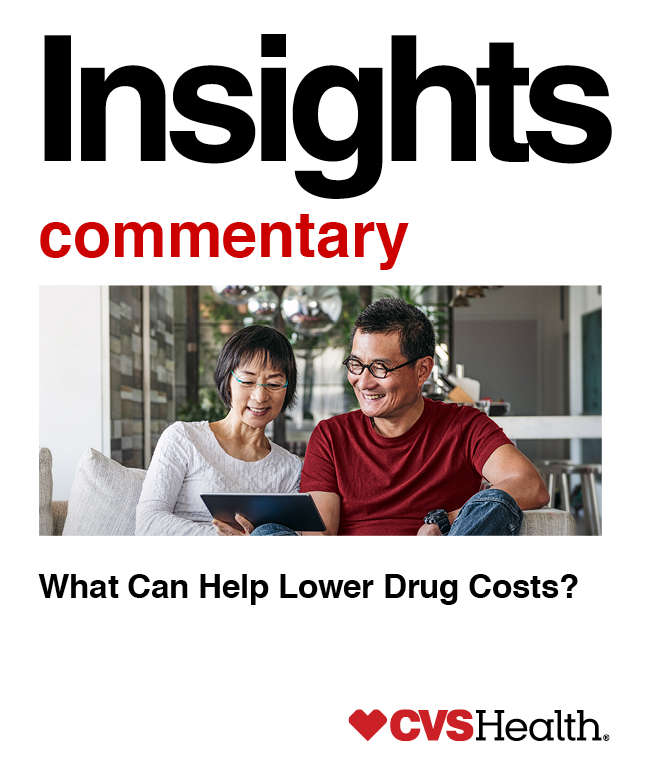 However, with drug prices skyrocketing and outpacing overall inflation, and new therapies launching with ever-higher price tags, out-of-pocket costs for consumers continue to be a challenge. At CVS Health, we do everything we can to innovate and develop solutions to help lower how much our clients and their members spend on prescription drugs. It is important to remember that manufacturers alone set the price of their medications and our job is to keep costs down. With the ongoing scrutiny over drug prices and the recent proposed rule by the U.S. Department of Health and Human Services, rebates have been prominent in the national health care discussion. Pharmaceutical manufacturers insist that drug price increases are driven by rebates, but this is simply not true. There is no correlation between list prices and rebates. Data show that in many cases list prices are increasing faster for drugs with smaller rebates than for medications with substantial rebates. Rebates are not secret or hidden payments to PBMs — more than 98 percent of the discounts CVS Caremark negotiates are passed directly to plan sponsors, who typically use them to reduce premiums and other costs for their members. We continue to develop innovations to bring escalating drug prices under control, especially for chronic conditions. To give clients even greater options in how to use these rebates to lower member out-of-pocket costs, we were among the first to introduce rebates in Medicare at the point-of-sale in the commercial market. This enables clients to pass along the value of negotiated rebates on branded drugs to their members at the pharmacy counter. Currently, almost 10 million of our clients’ members are in plans offering these savings. We were also the first — and still are the only — PBM to offer point-of-sale rebates through our SilverScript Allure plan. Another particular area of concern has been the rising cost of insulin. By using a range of innovative strategies, we have been able to reduce the total cost of diabetes drugs, including insulin, by 1.7 percent despite brand price inflation of 5.6 percent. We replaced two very high-cost insulins — Lantus and Toujeo — with Basaglar on our formulary, an effective lower-cost follow-on biologic alternative, and in doing so helped lower member out-of-pocket costs by 9 percent per 30-day prescription. What’s more, among patients who switched to the alternative, their A1C — or blood sugar levels — improved by 0.43. To put this in perspective, every one point improvement in A1C among patients with uncontrolled diabetes is correlated with approximately $1,400 savings per year in medical costs per patient. We continue to develop additional innovations to help bring escalating drug prices and costs under control, especially for chronic conditions. CVS Health has taken a condition-specific approach through our Transform Care programs to help manage chronic conditions effectively, wherever possible, preventing more serious adverse events, improving clinical outcomes, and reducing hospitalizations, emergency care and overall costs. We also offer our clients — especially those with high-deductible plans — the option to adopt preventive drug lists, which include medications to treat many common chronic conditions, with $0 copay whenever possible. This can help significantly lower member out-of-pocket cost by providing first-dollar coverage for many common, but important, medications. Indeed, we offer preventive drug lists to our own employees as they can not only lower costs but also improve outcomes. Despite what we have accomplished so far, we know more needs to be done. That’s why we support the U.S. Food and Drug Administration’s focus on bringing more competition with lower-cost alternatives to market faster. We also support various legislative proposals including those that end pay-for-delay tactics by manufacturers, create more transparency, and limit out-of-pocket expenses for seniors. We strongly recommend changing the rules governing health savings accounts to allow plans the ability to offer first-dollar coverage for all preventive medications as well as those for the treatment of chronic conditions. Our purpose — helping people on their path to better health — is what drives us to provide more affordable, accessible, and effective health care, and deliver better health outcomes, at a lower cost. Never has our work been more important than today. Our job is critical and we are proud to work with the employers, unions, and government programs we serve to ensure that when their members get to the pharmacy counter, they get the medicines they need at the lowest possible cost. All Data CVS Health Internal Analytics, except where noted.